Q. Congratulations. Is it one of the most memorable wins of your career? RAFAEL NADAL: I don’t know, no? But it is an emotional one, a very emotional one, yes. A lot of things happened last seven months, to be back here and to have this very heavy trophy with me is amazing, no? I am winning three straight top 10s, beating the top 5 of the world and No. 4 and not be in the top 4 and you play quarterfinals, no? So beating three top 10, three very important players, and win title like this is just something unbelievable for me. Very, very happy and very emotional. When, you know, when you have one comeback like I’m having is, you know, you remember all the low things, lower moments that you had during this seven months, doubts and all these things. Hopefully I passed, and just can remember all the people that really helped me a lot during all this time. Q. It looked like even in the second set when he was ahead you didn’t have too many doubts that you could actually come back into the match, and that you were confident enough that you changed strategy a little to come away with the win, no? RAFAEL NADAL: Well, I was in tough situation, because after starting the match 3‑0 playing fantastic in my opinion, I had big chance for 4‑0 and then I had good chance for 4‑1. So I lost all of these opportunities, important ones for me. So I got a little bit ‑‑ I lost a little bit my calm, I think, and then I started to play with ‑‑ I didn’t choose right the shots to change against his forehand, you know, to go inside the court. I think I was wrong in strategy for moments, something that for me is not usual, because normally I can have mistakes with the shots but with the tactics and the way how I have to manage the points, how I have to play the points, normally I am right. But, you know, I felt like he started to play more aggressive and I lost a little bit the way how to win the points, no? Had the break back in the second to give me a lot of confidence, and I was able to calm myself a little bit, to think, calm, to open my mind, and think what I needed to do to win the second set. And I was able to play against his backhand and wait for right moment to change directions my ball. I try to play, put the match in a little bit slower rhythm and wait for the right moments to go for the point and worked well. Del Potro is a fantastic player, so it’s not easy to change the dynamic of the match like this. I’m very happy. Q. When you returned on clay your expectations were at a different level, but coming onto this surface ‑ I know you’ve talked about it many times how tough it is ‑ does that make this week a very big one for you to actually prove to yourself that on this surface you can win, as well? RAFAEL NADAL: I know. I won in the past, right? RAFAEL NADAL: Well, I don’t have a lot of doubts that if I am healthy and if I am right I have a chance to win on these surfaces. When last year you are 4‑2 in the fifth of Australian Open 30‑15, when you are here losing in semifinals, when you are playing semifinals of Miami, you are there. You are in the semifinals and you are playing finals. Why you cannot win titles? That’s the real thing, because to be in that semifinal you have to win against players who are probably the same level that players who you will meet in the final, no? So it’s something that I don’t have doubts, but after you have to win, and I didn’t for the last couple of years. But is true I played a lot of finals, no? My results on hard I think were great the last couple of years, but remain the title, and now I did. That’s makes emotional week for me. Very important victory for me, winning, like I say before, against the best players of the world on a surface that is good for them. Seriously, it’s impossible to have better comeback, no? Happy for everything. Q. What’s your schedule between now and the French Open? After this result, do you think you’ll be able to sort of go into Monte‑Carlo ‑ I presume that’s your next event ‑ feeling the same way that you felt the last five, seven years going into Monte‑Carlo? I tried my best every year, and I arrived there thinking that I have to play my best tennis if I want to have any chance. I never had a different feeling. No, no, for me clay don’t mean victory. Clay mean this is the surface that I love to play and I had a great success in the past, but every year is a different year. Every year I have to improve. Every year I have to do different things if I want to keep winning on clay. And I try to do my best and I try to do different things and be better player every year to have the chance to make good results, no? So I’m going to go to Monte‑Carlo with the same expectations than ever, than always, and I gonna try my best to arrive there healthy and in good shape playing well. Q. How about Barcelona? Madrid? 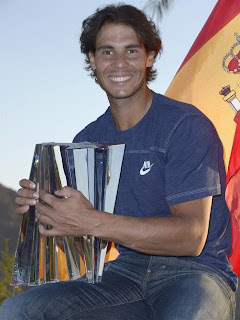 RAFAEL NADAL: That’s my schedule, the four obligatories and Barcelona. That’s my schedule. I go week by week since I came back. For example, I cannot go to Miami. I’m very sad for that. I’m very sorry for the organization of the tournament and I’m very sorry for the fans, but we never thought we’d be able to play all matches possible since I came back. The doctors recommend me to be back home for a few weeks and rest a little bit and keep practicing the right way. You know, I need more power on the left leg quadriceps, so I need to keep working hard. The competition is hard for the body, so after four fantastic weeks I can’t go to Miami. I need to prepare and rest for the next one. Q. You mentioned that winning this tournament brought to your mind all the lower moments. Could you take a moment and share one or two of the times when it was really difficult for you when you were off the circuit? Q. Was there one thing that kept you going more than anything else while you were out? RAFAEL NADAL: I like the tennis. I love the sport. So I love sport in general. I love to practice the sport. I love the competition. Even if I don’t have the chance to play tennis, I like to play football. I like to play different sports that for the last seven months I didn’t. So is not only a thing about tennis. Is thing about my life, and my life is very close to sport in general. I was not able to do nothing of things, no one thing that I really loved to do it. I love to practice sport, move my body, and only sport that I was able to do it was golf, that I love, but I really love the movement of sports. I miss the feeling to go on a big stadium with all people, all this atmosphere that makes you feel something different. And the feeling of victory, the feeling of competition, this adrenaline in life, there is much more important things than tennis. That’s only game. But probably the feeling that you have when you are in a competition, when you are winning a match, when you are winning a tournament, this adrenaline, this feeling on that moment is very difficult to find outside of this, no? Q. Can you talk about all the momentum changes in this match? I mean, you won the first three games; he won nine of the next eleven games. You won five straight. Talk about what you think made things change so much. RAFAEL NADAL: I didn’t say in the first answer? I don’t know. But I said I think I started the match playing great, very aggressive, making the right things to be in control of the point. Then I think Del Potro start to play more aggressive and I lost a little bit my calm. I didn’t make the right thing because I tried to change my direction against his forehand with my forehand in not the right ‑‑ in not a favorable position. So that produces more mistakes than usual. For that reason, I was not able to keep winning games. He was playing great. He was playing solid. I was playing with more mistakes and no chances. Then I was lucky to have the break back in the second set because the first game of the second set was struggle for me. Four mistakes with my forehand, and the last ‑‑ when I had the break back in the second everything changed. I found the way to win points another time, to be comfortable when the ball is in the middle of the point, know how to play. And after that break, in my opinion, I played the right tactic another time. I waited for the right moment to change against his forehand. Q. You said on TV that you were surprised by the quality of your movement today. RAFAEL NADAL: Yeah. (Laughter.) I was. Q. Do you play with painkiller? RAFAEL NADAL: (Through translation. Painkiller. Anti‑inflammatories? I play with anti‑inflammatories every day. I don’t know if that’s the same as painkiller. I don’t know in English. You know what anti‑inflammatory is? RAFAEL NADAL: So I take that every night before the match since I came back. Hopefully I can play without that in short period of time. Q. During your celebration you ran over to Larry. Why did you feel it was necessary to go to Larry Ellison and shake his hand? Can you talk about jumping on the low partition when you celebrated with your team? Your knees looked very healthy. RAFAEL NADAL: With Larry I think it’s very important to have someone like him supporting the sport. We just can say thank you very much to him for all the things that he’s doing for the sport. He’s very important to have, very important persons like him who really love tennis and who really show his passion for our sport and who is ready to convert this tournament in one of the best tournaments of the world. The tournament already is one of the best. But with these new things that gonna happen for next year and for the coming years, probably will become, without any doubt, one of the best tournaments of the world. Personally, I have a relationship with him and he supported me a lot. Just say thanks to him personally for everything that he did during last two weeks for me and for the support that I receive from him for always.